STOCKHOLM, April 8, 2019 /PRNewswire/ -- Daimler has together with NorthStar Battery created a tailored version of NorthStar ACE® - an award-winning wireless battery management system - called AGM Truck Test. This battery analytics tool is currently being rolled-out to all Daimler's service centers in Europe plus Africa, Asia and Latin America. The joint project is the next step in the relationship with Daimler which started in 2016. NorthStar Battery is a world leader in battery technology. Their premium pure lead AGM batteries is the prime choice for Daimler trucks in both North America and in Europe. NorthStar started delivering batteries to Daimler in North America in 2016 and subsequently initiated deliveries to Europe in 2018 for the new Mercedes-Benz Actros, Antos and Arocs models. As a further extension to the collaboration, Daimler has together with NorthStar created a tailored version of NorthStar ACE®, called AGM Truck Test, as an AGM battery analytics tool for Daimler's service centers. NorthStar ACE® is the award-winning battery management system that allows users to wirelessly retrieve real-time and historical performance data. The system was launched for the Telecom segment in 2017 where it has gained approval at several large operators globally. It was later introduced to the Transportation segment in 2018. With the tailored version – AGM Truck Test – Daimler can by tracking the performance of the batteries throughout their service life ensure that batteries are replaced only when they reach end of reliable life, not sooner. If a single battery fails it can be replaced promptly to protect the other batteries in the same circuit resulting in lowered total cost of ownership. The first version of AGM Truck Test was released by Daimler in Q1 2019 and is currently being rolled-out to all service centers in Europe plus Africa, Asia and Latin America. "We are excited about taking this next step in our relationship with Daimler. 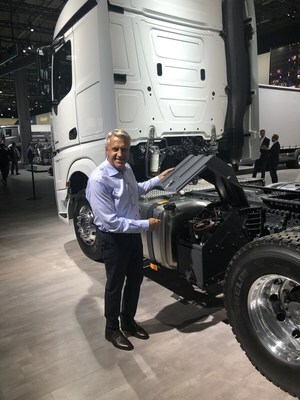 With AGM Truck Test, Daimler and their trucks will stay in the absolute forefront of battery monitoring for years to come", says John Semeniuk, President Transportation Division, NorthStar Battery. NorthStar Battery was founded in 2000 and is today a world leader in battery technology and energy storage solutions. NorthStar consists of two divisions – Transportation and Reserve Power. The group employs over 600 people worldwide and is headquartered in Stockholm, Sweden, and with manufacturing facilities in USA. NorthStar also has global distribution and service centers in North and South America, Asia, Middle East and Europe. Please visit www.northstarbattery.com.